← Love and Ice Cream. There are so many reasons that I love the French. I love their eternal revolutionary spirit that makes them refuse to play along by anyone’s rules other than their own. I love their preference of beauty over practicality, leisure over work, quality over quantity. But I especially love their ability to turn anything into an excuse to eat awesome food. Saturday was La Chandeleur, Candlemas. The French celebrate La Chandeleur by eating crêpes, but I actually had no clue why. Even the text book I teach from, when it came time to go over holidays, glossed over the purpose and got straight to the eating of crêpes. This past week one of my French colleagues finally explained why we eat crêpes on La Chandeleur. It marks the day that the baby Jesus was presented at the temple. Yes…. but how do we get from the baby Jesus, to crêpes bursting with Nutella? 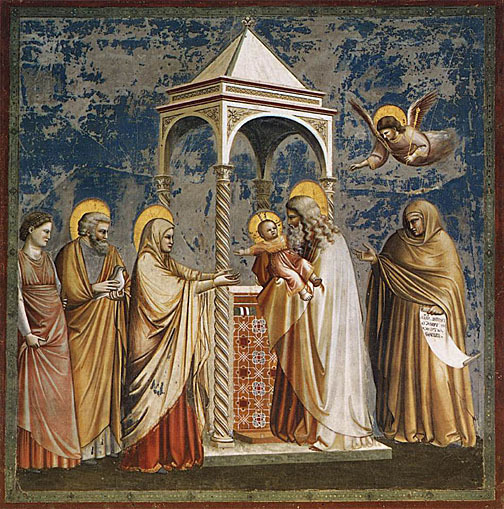 Well, in the old paintings of this presentation (like this one by Giotto), there is always a perfect circular halo around Jesus’ head. And then one day, it occurred to someone that that halo sure looks a lot like a crêpe. Thus a tradition was born. Did you catch that? The French have a whole holiday where they all eat holy halos. How can you not love them for that? After a year of making the traditional Tuesday night crêpes for the girls I nannied when I lived in Paris, I like to fancy myself quite the crêpe maker. But this was a little different, because according to the tradition, you have to toss the crêpe in one hand, while holding a coin in the hand you usually write with. Not so easy. We had friends over for the event, and things quickly descended into wild crêpe flinging. And what do Americans celebrate on Feb. 2nd? Groundhog day. No crêpes, no halos, no religious significance. Just a stupid animal to whom we attribute entirely unfounded wisdom. Supposedly Phil didn’t see his shadow on Saturday, but the snow falling yesterday didn’t convince me that spring is coming early. Regardless of how many more weeks of winter there are, grab the crêpe recipe below and make you some yummy halos. This is really just a ratio, so the amount below will make about 5 crêpes… multiply as you will! Combine all of the above and mix well. If the mixture is thick, add more milk to thin it out. Heat crêpe skillets until they are hot and wipe them with paper towel dipped in oil. You may only need to wipe them every couple crêpes. I have crêpe skillets from Williams Sonoma, Bed, Bath, and Beyond, and Crate and Barrell. The WS is by far the most expensive… and my least favorite. They other two are both cheaper, lighter, make better crêpes, and are easier to clean. Ladle in enough batter so that when you roll the skillet around, in thinly and evenly cots the bottom and up the sides a little. Let cook until sides pull away slightly then loosen edges with a knife or a cool wooden crêpe tool like the one at the top of the post. 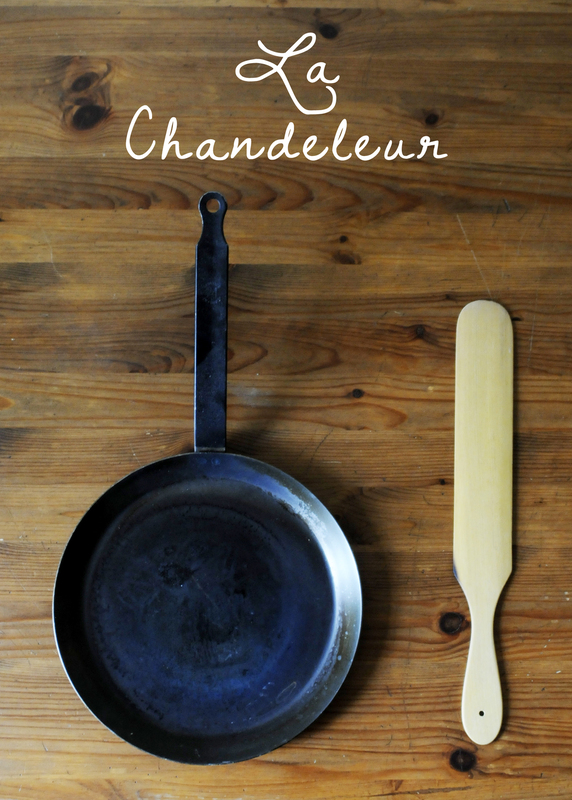 Use a spatula, or be brave and toss the crêpe to cook the other side. Cook just a minute or so, then slide to a plate. For sweet ones, you can assemble them off the heat. For savory ones, sprinkle cheese and toppings on the crêpe after it has been flipped, fold over like an omelet, and cook. Bacon, goat cheese, and honey. Don’t knock it till you’ve tried it. Nutella, bananas, whip cream. Classic. Ps: No post about halos this weekend would be complete without a reference to the highlight of last night’s Super Bowl, which was of course when Beyoncé finished her set with “Halo,” and shortly thereafter I’m pretty sure she left the game and took ALL THE LIGHT WITH HER. This is my explanation for the power outage and I kept on chanting “BRING BACK BEYONCE AND WE CAN PLAY IN HER HALO!! !” Because she is glorious. I might have originally tried to convince James to do a Beyoncé themed wedding so that “Halo” could be our first dance, in which case I would have had to rip off my dress and break it down in a leotard, Queen B style. If it’s been awhile since you have watched the music video, start your Monday off right and watch it NOW right here. Please appreciate that moment where her male counterpart tries to dance and all he can do is the step, shoulder dip, snap deal. So we all appear when faced with Beyoncé’s moves. I might have tried her speed squat/hip swivel this morning and I’m pretty sure I pulled something. This entry was posted in Uncategorized and tagged Cooking, crêpes, dessert, food, friends, photography. Bookmark the permalink. Love it. Let’s not mention how many crepes ended up on the floor. Ok…now I’m possessed with a desire to try the bacon, goat cheese, and honey crêpes. Jbrew and I are still pretty devoted to goat cheese and sun-dried tomato, but we should probably branch out! This one blows that one out of the water. It is just THE PERFECT combo of savory and sweet.